What used to be a tiny bookstore called Azil (Asylum) is now a bookshop café that combines two bookstores and a café. Azil has a bookstore sister called Beletrina next door and a café inside and outside this place. Novi trg or New Square in Ljubljana is surrounded with beautiful baroque palaces, so visiting this place will also give you the possibility to see one of the palaces from the inside. 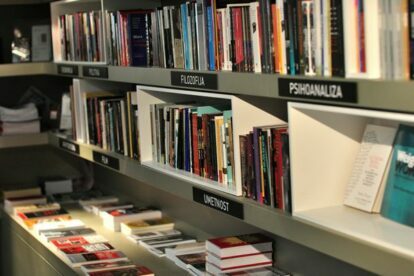 Azil is run by the Scientific Research Centre of the Slovenian Academy of Sciences and Arts, so what you can mostly get there is academic literature on humanistic and sociological sciences in Slovene, English, French and Russian. The atmosphere here is truly cozy and you can almost smell all the knowledge that the shelves store.